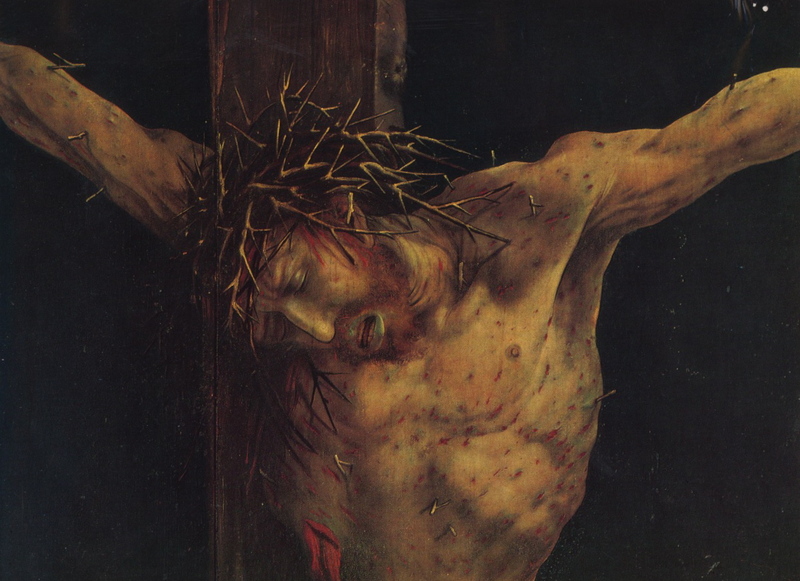 The gruesome imagery of the paintings is best understood with some history. The altarpiece was commissioned from Matthias Grünewald* in 1510 to decorate the chapel attached to a monastic hospital. Dedicated to the healer St. Anthony of Isenheim, the monks cared for the sick and dying. I imagine that the hospital was filled with outcasts patients who would not have been cared for at home, like those with the plague, small pox, leprosy or ergotism – an extreme poisoning due to rye fungus that results in psychosis and gangrene. (This disease was believed to be very prevalent. One figure on an inner side panel appears to have ergotism.) The patients were suffering and this painting in many ways was meant to sooth them, spiritually at least. The altarpiece has two sets of swinging doors thus producing three “views”. The majority of the time, the altarpiece was closed showing the Crucifixion with side panels of St. Sebastian and St. Anthony the Hermit. The central Jesus figure is a green tone, marked with sores and bleeding. His mouth gaps, his brow is furrowed and his hands writhe in agony. Clearly this is not the typical crucified Christ. The women at the cross wail in agony while an anachronistic John the Baptist stares at the viewer and point very clearly to Jesus. This central scene was designed for those in a great deal of physical pain. Here is a sympathetic savior and an example for meditation and prayer for both the patients and the monks who cared for them. There is a boldness but appropriateness to this depiction that reminds us that no hardship in life is too great. While the Ghent altarpiece was surely meant to (and continues to) astound and awe viewers, there is a deeper spiritual meaning to the Isenheim altarpiece once you accept the immediate visceral reaction to his brutality. 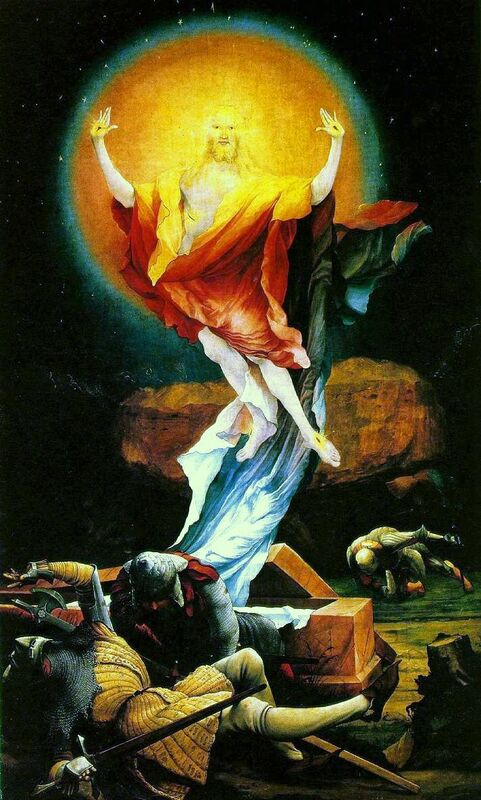 When the panels are opened to the “2nd view”, you see an glowing image of the Resurrection of Christ. Bright, soft, and fair the smiling resurrected Christ shows his wounds in triumph. It’s a fitting resolution to the suffering of the main central panel and a beautiful counter-point to the ugliness of death and physical illness experienced by the patients at the Isenheim monastery. Incidentally, the Musee d’Unterlinden has launched a series of events and features in 2012 to celebrate the 500th anniversary of the Isenhiem Altarpiece. Colmar is an hour drive from both Basel, Switzerland and Strasbourg, France. *Known commonly as Matthias Grünewald, the artist’s real name was Matthias Neithardt (ca. 1480-1528). When I worked in Basel, my office took a field trip to Colmar to see this altarpiece. It is massive and truly sickening; one of my colleagues even threw up after seeing it (but he wasn’t feeling so well already…). The sick who came for care to this site could identify with Christ’s suffering through this painting and so experience a kind of meaning in their own state and at least a kind of spiritual healing as you said. That’s an incredible sounding encounter with the altarpiece. Thanks for sharing. I sometimes wonder if modern viewers (especially in museums) encounter religious paintings in the same way contemporary viewers would have in churches and monasteries. It’s good to hear that the power of this image remains today. I’d love to see this painting in person, too! It’s my understanding that these monks were particularly known for their treatment of those with skin conditions. When I learned that, I had one of those oh-I-get-it moments. Although gruesome, I’m fascinated by this Christ, perfect for this hospital. I’ve always found the Resurrection panel a bit creepy, but your comment about it, the triumph that Christ shows as compared to the Crucifixion, makes me look at it differently. Thanks! beautiful pictures – esp the 1st and 3rd. I have always look for the stations of the cross when I visit to a church, just for their old and simple beauty. Recently posted (2012/11/11) a visit to Kecharis Monastery in Armenia, been there for 1000 years, and people still pray there.